Festival Period: 08 to 10 October 2019 Tshechu is the peak season throughout the year, early booking is recommended. On arrival, your guide will receive you at the exit gate of the airport. We will take a drive to Thimphu along the windy road taking about an hour. Thimphu, perhaps the most unusual capital city in the world, is the seat of government. This bustling town is home to Bhutan’s royal family, the civil service, and foreign missions with representation in Bhutan. In the evening will have dinner in one of the restaurant in the town to taste the local food. After breakfast drives to Tashichho Dzong, which was built in 1641. The Dzong houses the main secretariat building, throne room of His Majesty the King of Bhutan. Go to the festival site and witness the ongoing festival. 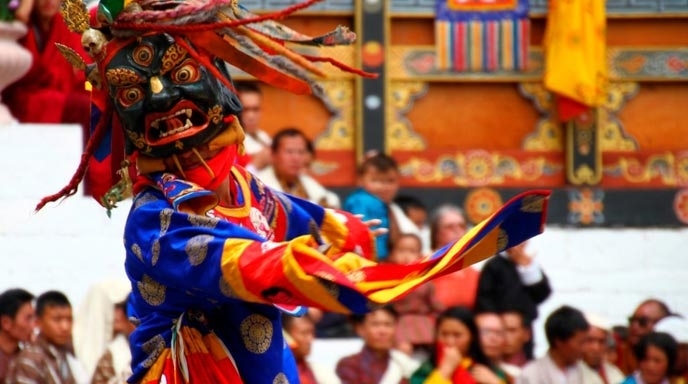 This festival is celebrated annually in fall in honor of Guru Padmasambhava. 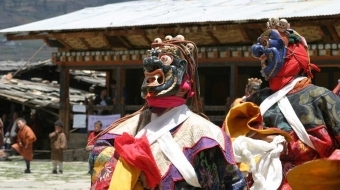 The dances is known as Cham, bring blessings upon onlookers. Deities are invoked during the dances; through their power and benediction, misfortunes may be annihilated, luck increased and wishes realized. The festival is also a social gathering where the people rejoice together, dressed in their finest clothing and jewelry. In the late afternoon drive to the Buddha Dordenma sited amidst the ruins of Kuensel Phodrang. It is one of the largest Buddha rupas in the world(51.5 meters). You can also enjoy the view of the Thimphu city clearly from here. On the way back to hotel stop at the National Memorial Chorten. Today’s sightseeing includes: visit to Bhutan Post Office, School of Traditional Arts and Crafts and the Weekend Market. 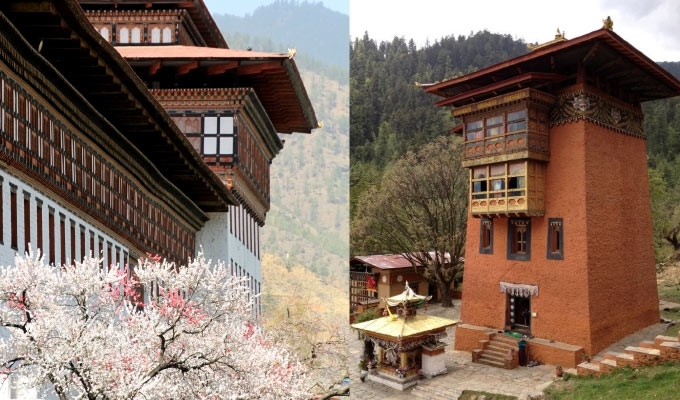 After that will proceed to Changgangkha temple in the hilly Motithang area; drive to the top the ridge overlooking the Thimphu Valley. Visit the zoo of Takin (National Animal of Bhutan), Drubthrob nunnery, were every evening the nuns chat prayers to end the day. Visit a handmade paper workshop where artisans create beautiful and unusual handmade papers, and weaving centre at Changzamtog where the looms are filled with traditional and updated versions of the world-renowned Bhutanese textile arts. Visit the government-run Handicrafts Emporium and privately owned crafts shops, which offer a wide range of handcrafted products, including the splendid thangkha paintings and exquisitely woven textiles for which Bhutan is famous. Today we will take a drive to Punakha (2 hours) across Dochu La (3050m) from where one can have a spectacular view of the Himalayas to the north when the sky is clear. 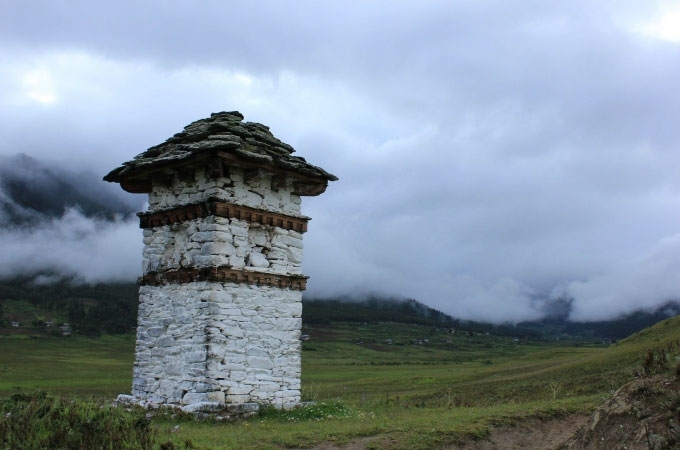 The pass is marked by 108 chortens (Stupa) which are Buddhist reliquaries, memorials to the teachings of the Buddha. 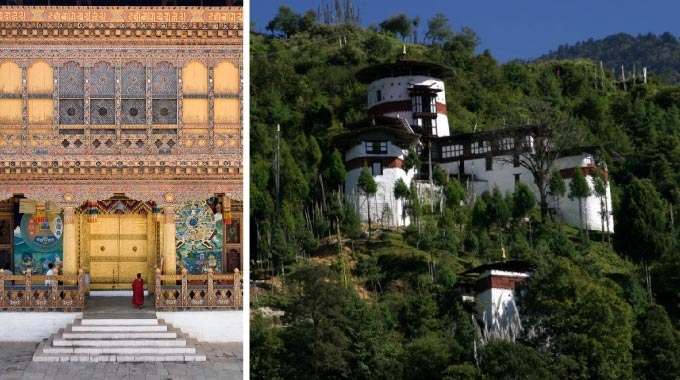 You will visit the new Druk Wangyel Monastery, which is the only of its kind in the country with elaborate paintings depicting the lineage of the present monarchy and their visionary works. We will visit the Punakha Dzong, built in 1637, on a strategic place at the confluence of Pho Chu and Mo Chu rivers. The Dzong has played a hallowed role in the history of Bhutan. Today after early breakfast drive to the Phobjikha valley, which is one of the few glacial valleys in bhutan. Visit the 17th century Gangtey Gonpa, the only Nyingmapa monastery in western Bhutan and it houses about 200 monks. After lunch we can have a walk down the alpine meadow passing by the habitat of the black necked cranes which come here in winter across the mountains from Tibet. In the evening return to hotel. After breakfast drive to Chimi Lhakhang which is a very popular and revered temple that lies on the periphery of the fertile valley of Lobesa. A brisk 15-minute walk through the village of Sosokha will lead a visitor straight to the temple. A sense and feeling of fertility and contentment is indeed in the air as one passes through the rich alluvial paddy fields. En-route visits the botanical garden which is the centre of a 47 sq mile Royal Botanical Park which forms one of the critical biological corridors connecting the Jigme Singye Wangchuck National Park and the Jigme Dorji Wangchuck National Park. After Lunch in Thimphu drive to Paro. Visit Ta Dzong; once a watchtower, built to defend Rinpung Dzong during inter-valley wars of the 17th century, Ta Dzong was inaugurated as Bhutan’s National Museum in 1968. Next in line is Rinpung Dzong; the Dzong continues its age-old function as the seat of the district administration, district court and the monastic body. 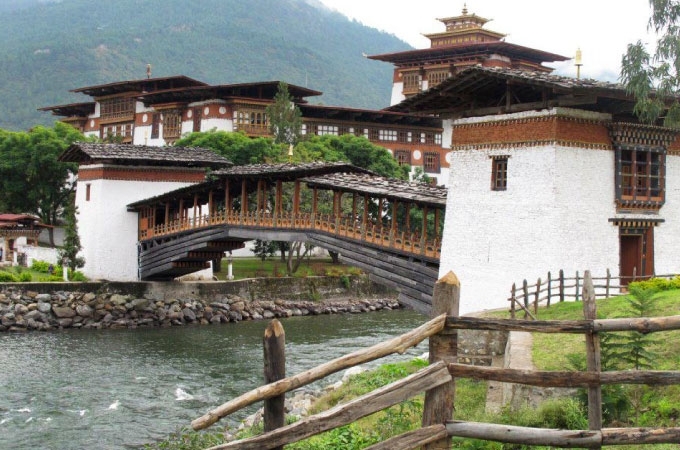 The southern approach to the Dzong has a traditional roofed cantilever bridge called Nemi Zam. A walk across the bridge offers a wide view of splendor of the Dzong’s architecture. 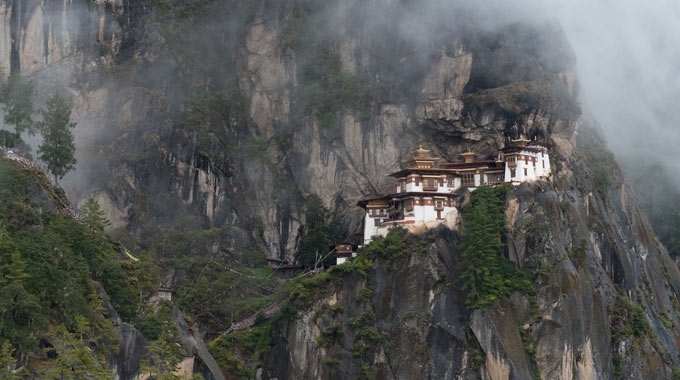 Today, we hike up to the famous cliff-hermitage called Taktsang, the “Tiger’s Nest”. 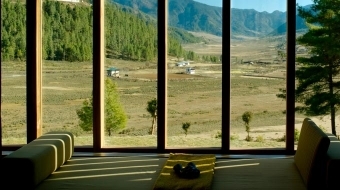 This monastic retreat is built into a sheer cliff face high above the Paro valley. Legend has it that the Tibetan Buddhist saint Padmasambhava flew across the Himalayas on the back of a tiger and landed here, bringing Buddhism to Bhutan. The trail to the monastery climbs through beautiful pine forest and an occasional grove of fluttering prayer flags. After visiting what is known as one of the most venerated pilgrimage sites in the country, we will go off the beaten track further up to the temples that are on the hill tops above Tiger’s Nest. It’s so peaceful there and you can really communicate with nature as you enjoy the views from the top be it that of mountains or the valley. We follow a different path to go down, that takes us through the pristine thick forest of oaks and rhododendrons festooned with Spanish mosses. Return to Paro International Airport for the flight. Here your guide and driver will bid you farewell, and soon the remote and legendary Dragon kingdom disappears again behind its guardian mountain.